Carrington retained the Halifax FA Sunday Cup when they edged an entertaining final by 2-1 against Waiters Arms at the Shay last night. Two goals in the opening exchanges suggested they might run away with it but their dogged opponents took the tie down to the wire. 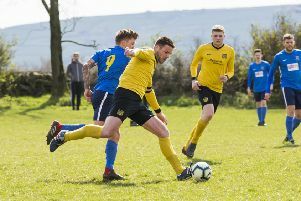 Captain Jay Carney was afforded space to run towards the Waiters penalty area and launch a fine effort from distance to give his side a ninth minute lead. A slick move saw the advantage doubled four minutes later; the ball was worked down the right flank into the penalty area where Damien Randall was hacked down for a penalty. Ethan Daly in the Waiters net made a good fist of keeping Jordan Coduri’s penalty out but the power in the strike saw the ball cross the line and put Carrington well in the ascendency. Carrington were now playing the better football, with the attacking quartet of Randall, Carney, Leon Hurles-Brook and Antony Brown causing problems with their slick inter-play. Waiters were more hurried on the ball and forced into hitting longer passes which weren’t causing as many problems for the Carrington defence. Brown had a couple of good chances to put the game to bed before the interval, whilst Hurles-Brook stung the palms of Daly. Waiters were rewarded for their resoluteness in defence as they rallied just before the interval. A Bradley Tynan cross was headed straight at his own keeper from point blank range by Robbie Graham, who was thankful that Craig Turnbull had the agility to push the ball clear. The keeper could do nothing about the goal that gave Adam Fenton’s side a lifeline right on half time. Full back Dean Park won’t forget his fine strike for a while, the ball looping over Turnbull’s head as he made it very much game on in the second period. Billy Grogan had a decent chance early in the second half, before a flash-point saw Randall and James Hurtley cautioned for their part in a brief touchline fracas. Manager Fenton’s words had clearly had the desired effect as Reece Uttley and another good effort from distance from Park were causing the Carrington management team of Dan Mullaney and Adie Cross food for thought. Their team are more than adept at playing on the counter, however, and Brown spurned another chance before Carney shot just wide. Lee Wood, playing at centre half for the injured Oliver Brierley, also made couple of stand-out challenges in an excellent defensive display alongside captain James Waggett, the best to deny Randall in the penalty area. With the clock running down, Wood was pushed further forward for Waiters and they created chances to force extra time. Both fell to David Chappell, who had been shackled well by Graham and Coduri at centre half for Carrington throughout. He managed to get touches onto deliveries into the box, including a dramatic chance at the end of injury time, but Turnbull was equal to the efforts. Waiters played their part in a fine match and won’t have long to wait to try and gain revenge. The teams meet again on Sunday in a potential title-deciding Premier League encounter. Waiters Arms: E Daly, L Albon (A Richardson, 82), D Park, J Waggett, L Wood, J Hurtley, D Chappell, B Tynan (O Coates, 70), R Uttley, B Grogan, C Maguire (A Rayner, 62). Unused subs: J Goodwin, H Talbot. Carrington FC: C Turnbull, C Pownall, J Wadsworth, J Coduri, R Graham, M Jones, L Hurles-Brook (J Salih, 90), H Kerris, A Brown (J Hiley, 94), D Randall (J Machon, 92), J Carney.